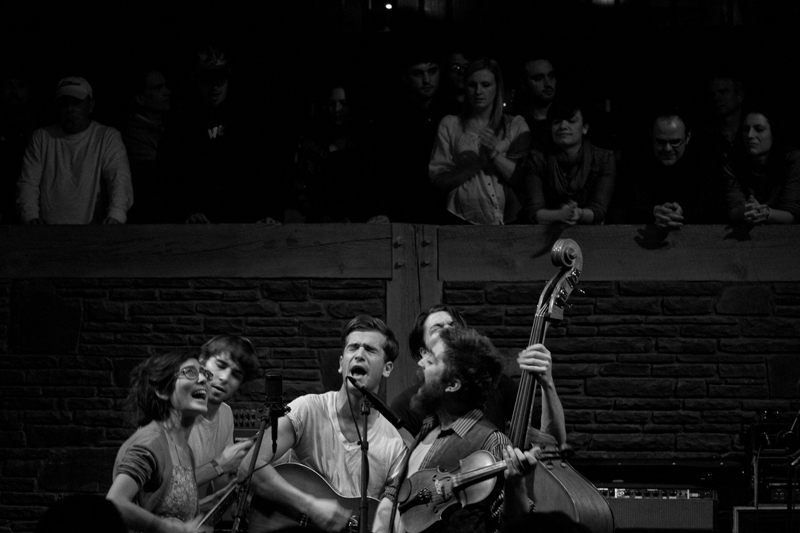 Spirit Family Reunion is a New York City-based string band, that serves up genuine and honest traditionally-inspired acoustic music with guitar, banjo, washboard, mandolin, fiddle, and percussion. With only one 6-song recording available (at their live performances and via mail order) the momentum for the ensemble is building fast. If the increasing amount of critical praise and a growing fan base doesn’t convince you that Spirit Family Reunion is an act on the rise, consider the fact that they have performed with such acts as Alabama Shakes and David Wax Museum, were named as one of Paste Magazine’s “Best of What’s Next”, and served as Levon Helm’s opening band at one of his recent Midnight Rambles. It should also be noted that despite these impressive credentials, the band keeps its inspiration and sense of mission out in front, while earning respect and accumulating fans the old fashioned way: performing wherever and whenever they can. They still play on the streets and subway stations for extra cash, while frequently performing in some of the most respected clubs in New York City. Uprooted Music Revue: Hi Nick. Thanks for participating in the interview. First, how would you describe some of the band members’ previous experiences before Spirit Family Reunion? Nick Panken: We all started playing music very young, each doing music in our own way for a while, learning at our own speeds. Some of us shared a Creedence cover band together, some of us were cast-mates in a high school production of Hair. Nick: A few of us went to the same public high school in New York City. After finishing with college in various ways, we got back together with instruments in hand and nothing better to do. This would be around 2008. That was the seed, and we slowly grew. Maggie convinced us we could book a little tour. Mat convinced us we should have his buddy Ken play bass. Both great ideas that are alive and well. As the band was developing it’s sound, what would you say each band brought most to the band? After the first gig, Mat came to us as a mandolin player, and he went out and bought a fiddle at a tag sale for $20. He brings a little cajun flavor with that thing, and then Stephen’s washboard is in that realm too. So it’s all a big mix of these different old sounds that are distinctly American. We like those old sounds that have been tried and tested. We could play in your barn, or in the subway, or on stage in a big club, and we don’t really have to change anything. Can you discuss the band’s working processes: performing, composing, and recording? How collaborative is each process? Nick: We never really did much practicing. If we try something and it’s not happening, we forget about it. At least for a while. That goes for writing, recording, and performing. Our attention span as a band is pretty limited, and that keeps us in check. We don’t force anything too much, but we also get restless doing the same thing over and over. So when it’s time to “work” it feels natural, it doesn’t feel like work, and when it’s time to quite working, everyone’s already quit about 15 minutes before anyway. Nick: We’ve all got our own identities, but it’s a love for old music that unites us. In the early days, we’d be hanging out, and someone would start singing a song from their repertoire, and probably one or two of us would know the song by heart just the same. It could be an old traditional, or something by Woody Guthrie, Hank Williams, Gram Parsons, Gillian Welch, Tom Waits, etc. We like to listen to a radio show by this DJ named Bob Dylan. He plays a lot of different sounds that we like. Can you discuss the band’s recordings and what’s coming up next? Nick: Before anything else, we started recording some of our songs on a cassette 4-track machine, overdubbing the musicians we wished we had. Then we recorded the first little version of the band on a Tascam 388 8-track machine, and sold that CD in brown paper bags. We got a few shows with that CD, probably more than we should have. When the band really came together, we wanted something that was a little more accurate than the paper bag CD had become, so we booked some time at a friend’s studio, and that is the 6-song CD we still sell today. We’ve always had so much fun playing for people that locking ourselves in a studio never sounded like fun. But we’ve been selling this CD for a while now, so we’re back in the studio, looking forward to finally having something new out soon. What can new listeners expect from Spirit Family Reunion live shows? Nick: A chance to sweat, sing, and dance, hopefully with a bunch of other people who are doing the same. We give it our all on stage, we have a lot of fun up there, and we try to play only exactly what needs to be played, whether it’s all old traditionals, or all quiet slow songs. That’s where we feel the best, with that spontaneous energy. Sometimes there is this real intense energy in the room when it feels like everyone is on the same plane, everyone has the same focus. People will come up after and give us this real sincere “thank you”, but I feel like thanking them because it sure is a two-way street. Without this energy from everyone in the room, we’d just be playing some boring songs, slightly out of tune. How does being a NYC/ Brooklyn-based band influence, inspire, and influence the band? Nick: Playing in NYC, specifically in the subways and on the streets, taught us how to sing loud and stick together. We’re always playing in the subway, anywhere where we can make a buck, because it’s a great place to practice, and because living in NYC is expensive. We’ve done an hour in the trains and made over $100, then gone straight to the bar and played for maybe $20. What’s next for the band in 2012? Nick: If we don’t do anything else this year, it will be a memorable one because we just got to play at Levon Helm’s Midnight Ramble. That was a big dream come true! Hopefully some more dreams will come true this year. But at the end of the year, we’ll still remember that night in January when Pete was playing drums to “The Weight” next to Mr. Levon Helm.